The beauty of this dish, apart from its fabulous flavour, is that you can make it up to 2 days in advance. Cook for 40 minutes, then cool, cover and chill. On the day, reheat for 25-30 minutes until golden and tender. Preheat the oven to 200°C, gas mark 6. In a large frying pan, melt 25g of the butter with the oil. Add the leeks and celery, and cook for 8-10 minutes, stirring until soft. Season well and stir in the garlic. Cook for 1-2 minutes and set aside. Grease a large deep baking dish (about 24cm x 30cm x 5cm). Spread a third of the cooked leek and celery in the bottom of the dish. 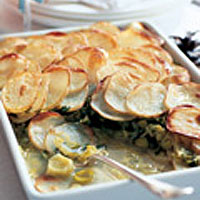 Now layer a third of the potatoes on top with a third of the parsley, roughly chopped. Repeat with two more layers. Pour over the vegetable stock and dot with the remaining butter. Bake for about 1 hour, or until golden and the potatoes are tender.